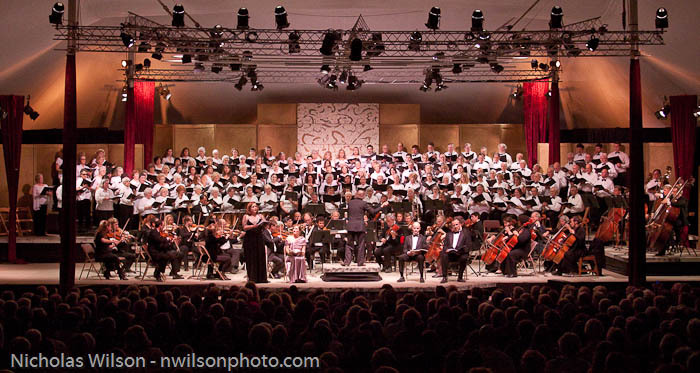 The Mendocino Music Festival Orchestra and Chorus in concert in the festival's giant canvas concert hall. 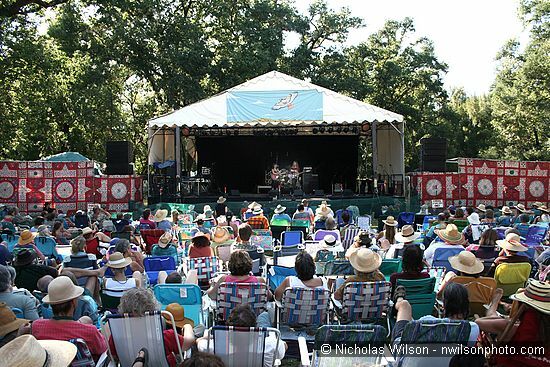 The Mendocino Music Festival takes place in July each year in Mendocino, California. 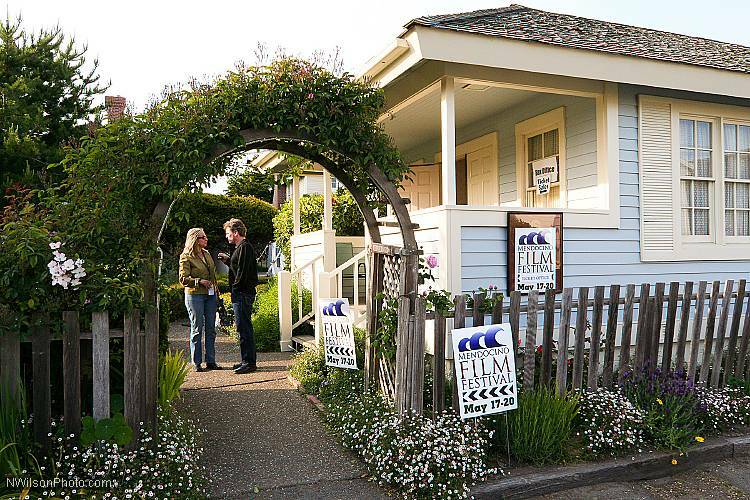 The Mendocino Film Festival is held the first weekend of June in the town of Mendocino. Nicholas Wilson has been one of the festival photographers since the first season in 2006. The 2006 festival box office in the historic Kasten-Heeser House, now part of the Mendocino Hotel Garden Suites..
Click the photo above or here for an index to the web photo galleries of each of the MFFs seasons. is available on special DotPhoto.com pages where you can see them and order prints and full screen slide show DVDs. These links open in a new browser window. Note: The site search feature on nwilsonphoto.com will NOT search these photos because they are on a separate server. 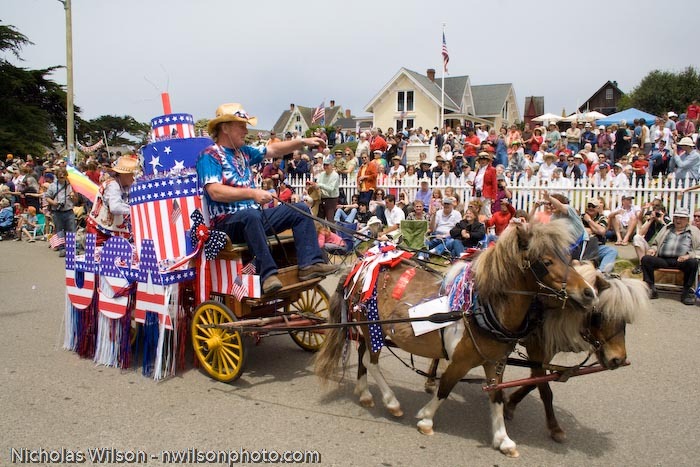 Miniature horses and wagon pass Mendocino's Kelley House Museum in the July 4, 2008 parade. View 2008 photos as a Flash Slide Show. After the slide show starts - if you have a high speed connection - you can click on the full screen button for big, screen-filling images. Don't try to go full screen if you have a dial-up connection. Once the show begins, you can click the pause button, and then you can go forward or back with the arrow buttons, controlling the pace of the show manually. You can order a DVD of the slide show that you can view full screen on your computer or DVD player. You can order prints too, from the slide show or the album view. 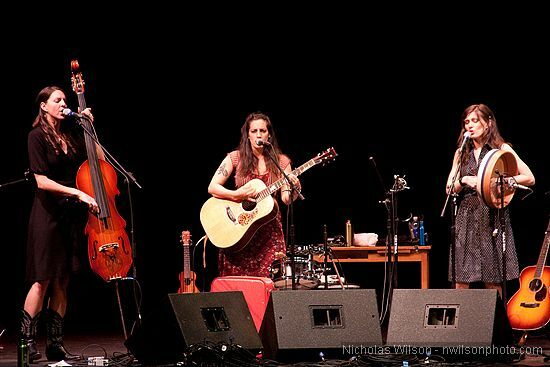 The nationally known Wailin' Jennys and the Mendocino Coast's own Blushin' Roulettes are acoustic music ensembles that write and perform original music. They appeared in a concert benefit for public radio station KZYX&Z at Fort Bragg's Cotton Auditorium on March 7, 2010. Click to view a web photo gallery. 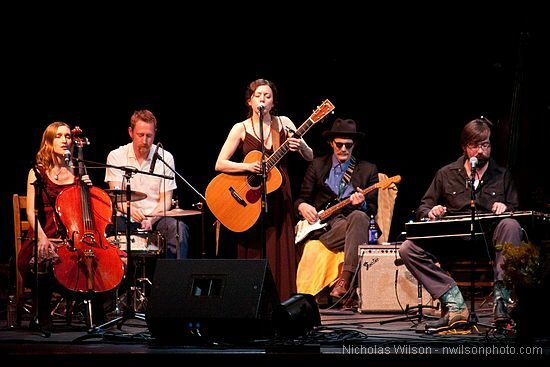 The Wailin' Jennys (top) and The Blushin' Roulettes at Cotton Auditorium. 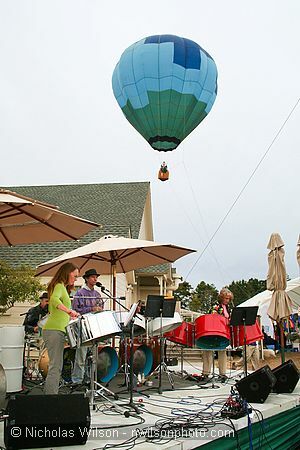 The annual CasparFest fills the Caspar Community Center with music, artists, crafters, and "green" enterprises – all sharing traditions that connect with the sun, the planet, and the finest traditions of lasting technology from the folk of many lands over centuries. Renowned multi-instrumentalist and honorary Casparado Joe Craven leads Gertie, Caspar's reclusive Gorse Monster, on her annual procession amongst the booths, local musicians jam on the outdoor stage, and babies dance in the grass. Beautiful handmade objects are admired and change hands. Delicious locally-grown food is prepared and shared. Caspar, the friendly ghost town, is a former sawmill town on the Mendocino Coast of California midway between Mendocino and Fort Bragg. CasparFest 2007 featured Kevin & the Coconuts steel band, hot air balloon rides, workshops, and lots more. Click the photo or here for a web gallery of 50 photos. Since 1979, the people of Elk have put on the annual Great Day In Elk, a parade and carnival of fun and games to benefit the Greenwood Community Center. The carnival features live dance performance, live music, food and drink, and a Saturday night dance. 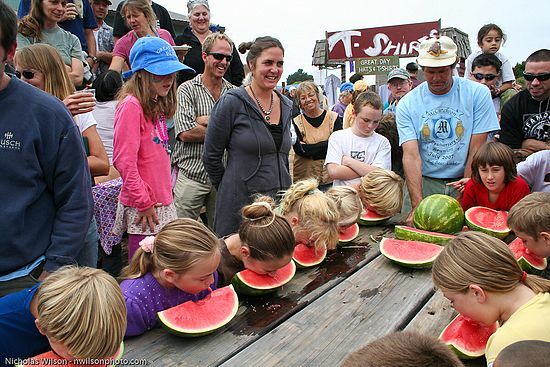 There are old-fashioned events like a watermelon eating contest, sack race, greased pole climb, egg toss and plenty of fun for young and old. Don't miss the 2008 Great Day In Elk, Saturday, August 23, 2008, parade at noon! 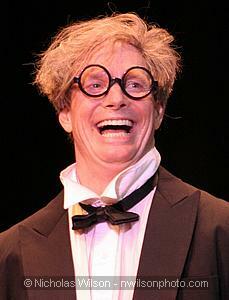 Bill Irwin "By The Seat Of His Pants"
The great actor, clown and physical comedian captured on stage July 8, 2007, in a benefit performance for Mendocino Coast Clinics in Fort Bragg, California. Click Bill's photo below to enter the gallery. 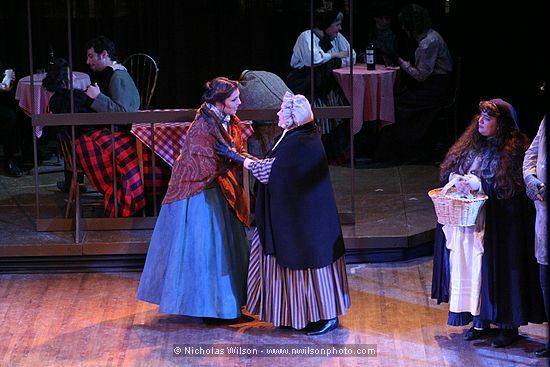 Nicholas photographed the final performance of the opera in Fort Bragg, California, in April 2006. Click the title above or the photo below for more information and a link to the gallery. Mimi (Jessica Julin, soprano) and townspeople (chorus members) in Paris, circa 1890.